Requires: macOS 10.7 through 10.14 (older versions available). Works with: Alfred, Dropbox, Finder Tags, Fujitsu ScanSnap, Hook, iPhone/iPad, LaunchBar, MailTags, PDFpen OCR, PopClip, Skim, and more. See what’s new in version 1.8.7 (released April 3). Just press the capture key (F1 or Option-F1) to import a Web page, mail messages, the selected items in Evernote or other apps, or any file on your Mac. 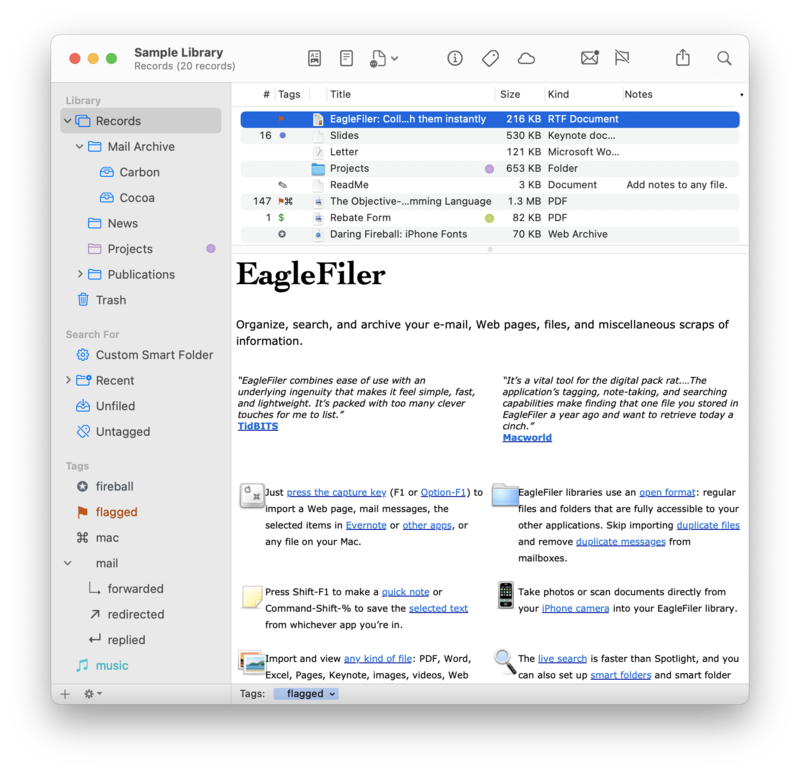 EagleFiler libraries use an open format: regular files and folders that are fully accessible to your other applications. 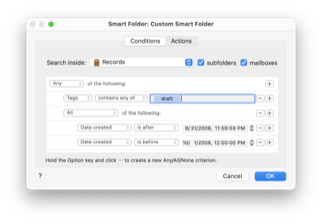 Skip importing duplicate files and remove duplicate messages from mailboxes. Press Shift-F1 to make a quick note or Command-Shift-1 to save the selected text from whichever app you’re in. 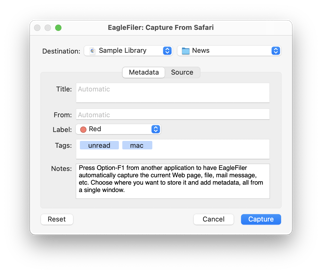 Take photos or scan documents directly from your iPhone camera into your EagleFiler library. Import and view any kind of file: PDF, Word, Excel, Pages, Keynote, images, videos, Web archives, scanned documents, and other proprietary formats via Quick Look plug-ins. 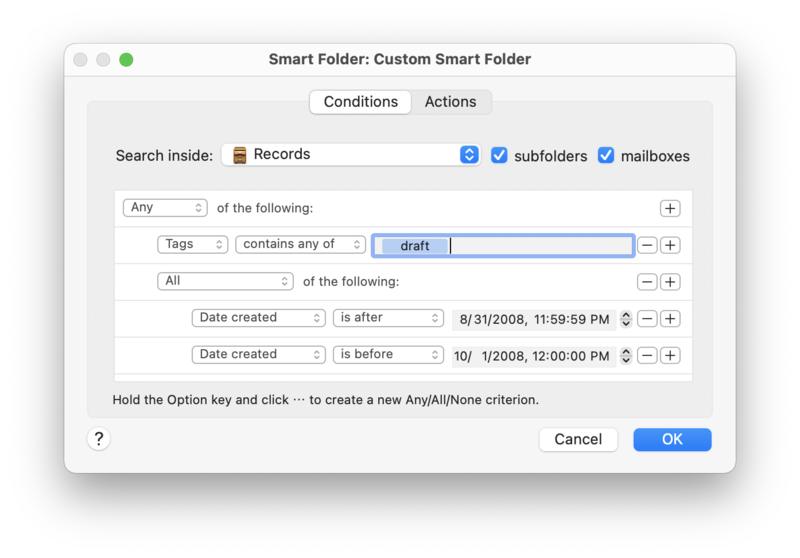 The live search is faster than Spotlight, and you can also set up smart folders and smart folder actions. Search all your files and e-mail attachments, and see the matches highlighted. Archive your e-mails (including attachments) to speed up your mail program or create a safe, fast backup of your IMAP server. 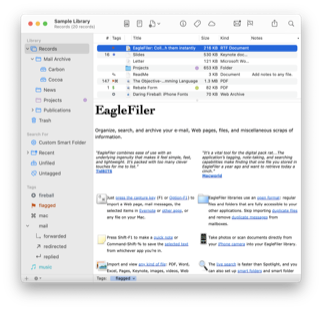 EagleFiler can convert from Apple Mail, Microsoft Outlook, .eml, and other formats to the standard mbox format, and it’s designed to handle tons of mail efficiently. Save Web pages as self-contained Web archives, PDF, or RTF files, including all the images, formatting, and the original source URL. Or just save bookmarks for pages you want to go back to. Import bookmark lists from Pinboard, Safari, etc. Use the Mail-like interface to view your folders and file contents in single streamlined window (or multiple windows, if you want). 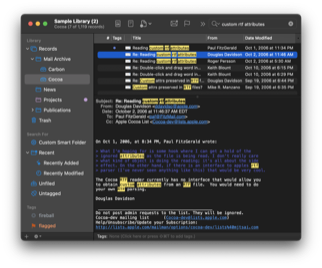 Rich text (RTF and RTFD) and text files can be edited directly in EagleFiler. Double-click any kind of file to view or edit it in a specialized application. Add tags and notes to your files. 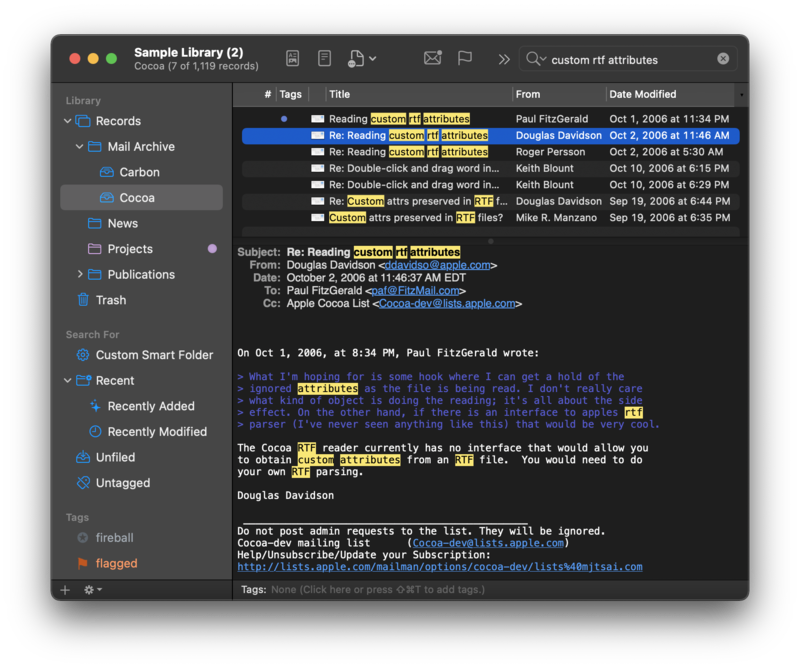 EagleFiler tags work with Finder tags and add features like hierarchy and symbols. Notes can contain rich text and links. Flag important files, keep track of which documents are unread, and assign colored labels that also show up in the Finder. Secure your library using industry standard AES encryption. Everything is viewable and searchable—once you’ve entered the passphrase—but even the indexes are encrypted on disk. Designed with data integrity in mind, EagleFiler ensures that your files are stored safely, and it uses checksums to verify that none are lost or damaged. Let it protect you from bit rot. Create multiple libraries, store them wherever you want, open more than one at a time, and drag and drop files between them. Automate EagleFiler via AppleScript. Write stationery scripts that are triggered when you create new documents. Files in your EagleFiler libraries (and their notes and tags) are searchable via Spotlight. For more information, please see the feature list, screenshots, or the extensive user manual. What Can You Do With EagleFiler?